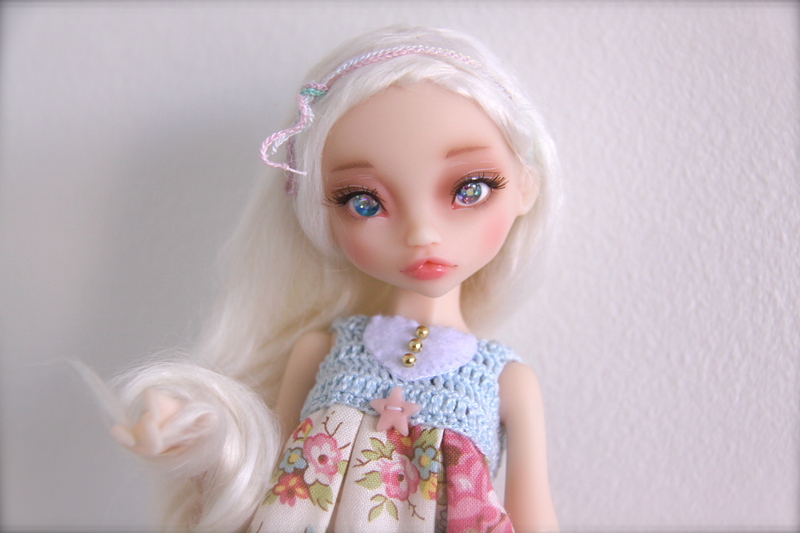 i have showed off my new Noble Dolls Rhubarbe here, but i don’t think i ever revealed her name – which actually took me quite a while to decide on! it wasn’t until i received her new eyes (they were the optional extra purchase with my Pukifee Cony fullset) that her name became clear. she is now Aurelia 🙂 i think it was something to do with the sparkly eyes that made me think of the heavens, which made me think of Aurora, but then that morphed into Aurelia (which has actually been a name i have loved ever since i saw Love Actually – remember Colin Firth’s housekeeper???) i think it’s perfect for her. my plan with Aurelia is to try and make some of her clothes, considering she is that bit bigger than Pukifees, which hopefully makes it that bit easier. also, because she is a weird size it’s a harder to buy clothes that i like for her, and i don’t have the funds at the moment to commission any. here is my first attempt! it’s a really simple effort – a wide broderie anglaise trim became the body of the dress, which meant i did not have to hem the top or bottom, and some smaller broderie anglaise trim became the straps. i simply hemmed the back edges of the dress and sewed the straps on. the dress fastens with a clear press stud – simple, and exactly what i was after for now! seriously, this is one beautiful doll.